A new homebrew title for the Vectrex has been made available for ordering (lose cart only and already on back order) called SpideX. If you watch the video below, the game will remind you of another vector game from the arcade called Black Widow. The game lets you play with one or two controllers, with the latter mode emulating that action as seen on Black Widow (one controller for moving, one for firing). There is no overlay but one of the available generic overlays should work just fine for this. I'm sure that, with time, someone will create a suitable overlay for the game. The game is delivered in a 3D printed cartridge that plugs directly into your Vectrex console. There are 12 levels in the game, and 11 different enemy races. I really wished I had a Vectrex! Black Widow is so much fun and this looks great. I don't think you even need an overlay for it. It does look fun. I've played Black Widow and it is indeed a nice game. This clone looks just as fun. An overlay is not really necessary to play but it is always cool to see stuff colorized on the system. That is so cute. 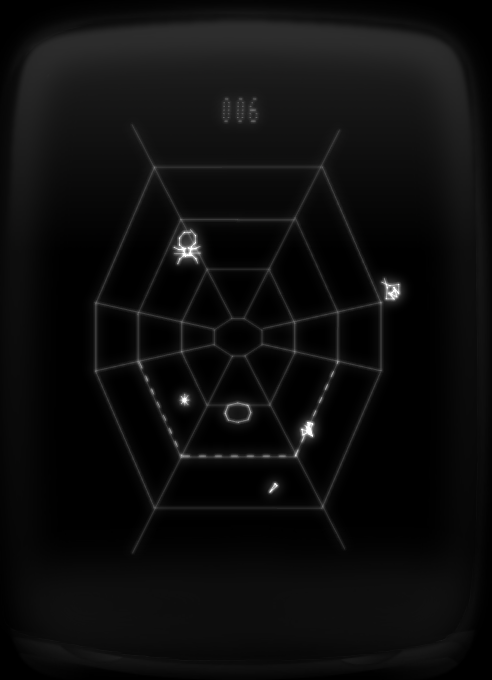 I've made a version of Black Widow for PC & Mac and I would never have dared trying to put it on the Vectrex - as I would without doubt have tried to cram too much in - but SpideX seems to keep the core gameplay, but just downscaled to work on the Vectrex. Well done. That looks great Sokurah. Good job. This is amazing work, really need to get me a Vectrex this year. And your version Sokurah looks awesome too, will have me a play of that. This is already sold out. I managed to place an order but I'm on backorder as there were only 50 made for the sale and I'm order 76.